PRAGUE, Czech Republic, Oct. 30, 2015 /Christian Newswire/ -- In spite of a generally cool spiritual climate in certain European countries, an awakening is unquestionably brewing. The Czech people are gathering in churches and home bible studies to explore the life and teachings of the person, Jesus Christ. Several Christian groups have deep roots in the hard soil of central Europe that are beginning to bear exciting fruit for the Kingdom of God. 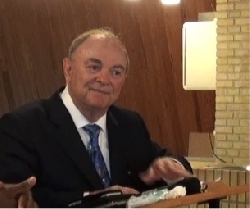 Both Pentecostal and Evangelical Christian congregations invited Pastor Altschul to administer encouragement and admonition speaking God's Word as it relates to the end time age of the church. After teaching, Pastor Altschul ministered to the congregations' individual needs through prayer. It was a great source of joy as the Holy Spirit revived individuals to health and understanding, which they shared through testimony to their congregations, communities and neighbors. One of the lay leaders of the Pentecostal Church in Olomouc received a miraculous healing from scoliosis after several long years of pain from the sideways curvature of her spine. Doctors could only prescribe wearing a back brace for the pain and ordered her to stop all exercise. But, after the support of prayer with Pastor Altschul, she testified the pain stopped immediately and ran to look at herself in the mirror. Shocked to see her hips had been straightened, she happily returned to the congregation and testified. Days later she rejoiced in a home Bible study with her pastor and congregation exclaiming: "My doctors examined me and found that I was no longer considered with the illness of 'scoliosis!'" And just outside Prague at the Pribram Church of the Living God, another miraculous healing took place. The wife of their English translator had severe back pain for several years. The many doctors she consulted could do nothing for her and told her to stop working altogether. But believing in the power of prayer, she attended the church service the day Pastor Altschul was visiting. During the ministry portion of the service, Pastor Altschul prayed with the translator's wife. Pastor Altschul later described, "I could see she needed to receive her healing in stages, so I spoke to the congregation that she needed several moments to rest between the three prayers that were administered." Within an hour after the church service, the pastor of Pribram Church received a phone call from the translator and his wife proclaiming, "My wife is smiling, she is running around the house, she is even jumping up stairs with no pain, God heard our prayers and all the pain in her back is gone, this is a miracle, and we wanted to call you and share with you the Lord's miracle for my wife!" Pastor Dan Kolinger, spokesman for numerous church congregations in the Prague area, informed Great Among the Nations, "Our team was in prayer for an impactful outcome of your visit, and over the course of many ministry events with Pastor Altschul during these few days in Czech Republic, we saw glorious testimonies of a Living God take place for the sake of restoring His people." Pastor Kolinger continued, "Several pastors traveled across the country by train for five hours to be here for our events, and they are returning to their congregations inspired and ready to reach and teach!" For further information about Pastor Bent Altschul and his ministry, Great Among The Nations, please visit www.gatn.org.